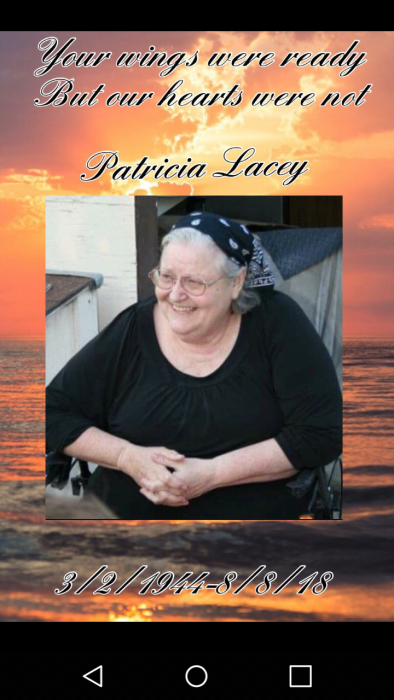 Patricia Louise Lacey passed away at her home peacefully surrounded by her loving family on August 8, 2018. She was 74. Mrs. Lacey was born and raised in Watsonville. Daughter of Charles Burke and Pauline McCombs. Born on March 2, 1944. She was a retired taxi driver who loved her family and enjoyed the Babies. Patricia was a Christian woman who loved Jesus Christ (aka, JC). She was a very giving person who helped anyone in need, she will be missed dearly, there was never a stranger to her, she treated everyone like family. Patricia Louise Lacey is survived by her Sister Stella Martinez, her two sons, Mark McCombs, and Glenn (Eddie) 0lsen; five daughters, Janet Ramirez, Nena McCombs, Lynne Munoz, Glenda Frye and Melanie Reynoso; 23 grandchildren and 25 great-grandchildren. She was preceded in death by her husband, Leonard Lacey; her son Joseph Olsen; siblings, Fred Burke, Charles (Sonny) Burke and Dorothy Johnson. Burial will take place at Pajaro Valley Memorial Park at a later date where she will rest with her Son Joey. Mehl’s Colonial Chapel was entrusted with the arrangements.